Product #60821 | SKU 54.266400 | 0.0 (no ratings yet) Thanks for your rating! Lightweight and compact mattebox that holds three 10.2x14.3cm filters, attaches to 15mm lightweight rods, swings away for easy lens changes. 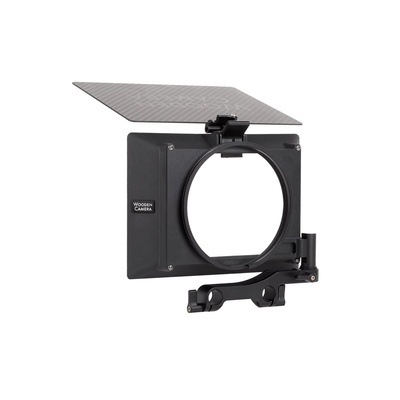 Wooden Camera Swing Away 4x5.65 Zip Box Pro is a lightweight and compact mattebox that holds three 4x5.65cm filters, attaches to 15mm lightweight rods, swings away for easy lens changes, and has a folding top flag which covers the front of the mattebox for protection during packing. This system can also be adapted to studio rods by adding a LW 15mm Adapter V2 (19mm) or LW 15mm Adapter V2 (15mm Studio). Swing away bracket includes ability to tilt by loosening two screws on the side. The same two screws also allow for vertical adjustability of 4mm up and 4mm down from lens center. One or two filters can also be tilted by offsetting them in the filter tray and leaning them back into the housing. Filters are loaded from the front of the mattebox and are securely held by a spring loaded latch. Top flag is made of lightweight carbon fiber and covers the front of the mattebox which is great for protecting the lens between takes. The flag can be removed by loosening the top thumbscrew, aligning the tab with the key slot, and pulling out. Rear opening of the swing away back is 114mm and snap in reduction rings are included for common lens barrel diameters of 110mm, 104mm, 95mm, 87mm, and 80mm. A universal cloth donut is also included for non-standard lens diameters or lenses that have a moving front while focusing. The cloth donut should also be used when tilting the Zip Box Pro using the swing away bracket. If clamp on version is desired, swing away back can be removed by 4 screws and replaced with clamp on backs with sizes 114mm, 110mm, 104mm, 100mm, 95mm, 87mm, and 80mm.